Hi, I'm Sara Huber. Farmer, food lover, head of schemes, funny faces, and making up silly songs at Shared Seasons. This is my endeavor to write a little something about our experiences running a small farm, living in a tiny house, and generally living more life than can fit into 24 hours. We had two dates to sell at the Domes Winter Market in Milwaukee this winter, so we got to practice our winter growing skills with our hoophouse carrots! We harvested and washed these carrots on Friday, then turned around and sold them at the market Saturday morning! You’ve never had a fresher, sweeter carrot on December 16th! What a treat! We invited our whole farm team out to party this weekend! Sorry that we missed a few folks for the picture, but we were glad to get to give everyone a big thank you for all your hard work and dedication this summer! And thanks to Mary for the new bench! It’s Good Enough! Thank you to all our WONDERFUL farmers market customers, and our wonderful sales people who have shared our produce with you throughout the summer! 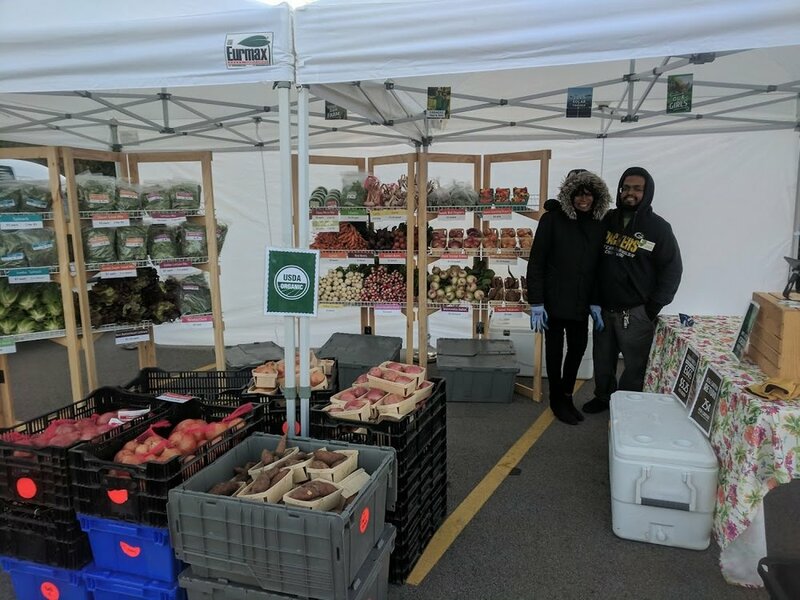 Wow, we love showing up on Saturday morning to see all the friends, familiar faces, and folks who are going to go home and enjoy our delicious produce! And we have to celebrate the people who have helped us bring it to you all summer long! A big thanks to Deb, Megg, Jo Ann, Karen, Joseph, and Raymond! Also, our thanks to the market managers of Fox Point, Tosa, and Brookfield Markets - you run amazing markets that we’ll lucky to be a part of! We partnered with UW Extension to host a Cool Tools Field Day here at the farm - what a blast! Fellow farmers both begenning and experienced got the chance to see our farm, our favorite tools, and to cap it all off, meet with researchers to see some tools in development now to help small scale farmers like us! Look at all those cool tools! Yes, the rain quage stopped counting after 5 inches, and parts of our field were washed out. New Market Displays are a Big Success! This is a custom design, and my brain child. I decided I think that TABLES at farmers markets have been overdone! It takes so much effort to decorate a table, so I said, what if I built something to display our produce that didn’t need a table, and a lot of thinking, I came up with these display racks, and me and our farm crew built them! If you’re another farmer, or market vendor looking at these, I’d like to invite you to use the design. I’m not going to try to sell the plans or build them to sell. I think it’s a great idea that I’d like to offer up as a gift to other farmers if you’re interested. Every season, we are blessed to share our farm with wonderful people, and this year is no exception! We have the best crew of dedicated, loving, hard working, and FUN folks that you could ask for! Thank you to everyone who puts in time to growing our wonderful local food community! We love you! Yes, this is the dream! All our chickens are out in a mobile chicken coop out on the range! They get moved to fresh pasture every week, and they LOVE, LOVE, LOVE it! It makes us feel so good to give our chickens happy, healthy lives, so they can lay the best darn eggs you’ve ever tasted! Have you seen how yellow those yolks are?! The new BIG solar panels!! We’re 100% SOLAR! We installed a big (ask Paul if you want the technical details) bunch of solar panels! They’re big enough to meet 100% of our electrical needs! To power our walk in cooler, our irrigation pump, our lights, and of course the coffee machine! This is a huge step and something we can really feel proud of investing in! The walk in cooler next to the new washing and packing building at the field! 100% solar powered! Spring Building Brings Summer Structures! Building the new washing, packing house in the veggie field! We did a lot of building this spring! We put up two new 20’ x 40’ hoophouses. One was for our pastured chickens to have a mobile coop, and the second was to be our new washing, packaging house in the veggie field! We also built out all the nesting boxes for the mobile coop, all new shelving for the farmers markets (see another post on that), and we can’t forget the Franken-table that got built too so we had a home for the coffee cups! It was a busy, building spring! Looking Backwards & Forwards - from 2017 to 2018. Amazing crew! Wow - we had the best group of committed, smart, and fun folks this year! Tiny House! We moved into our tiny house in the winter of 2017, and we've now had our 1 year anniversary of tiny living. It's quite the upgrade from my 2016 tent! Trip to Europe! Paul & I were so lucky to travel with research cohorts from Michigan State, to France and Switzerland and learn about their farms and food systems. Warm Welcome into Brookfield and Tosa Farmers Markets! This was our first year at each of these markets, and the enthusiastic reception from these communities made every week a joy. Working with amazing restaurants, including Cafe 1505 in Mequon and Simple Cafe in Milwaukee. New hoophouses! We were able to grow a WAY LONGER season of tomatoes this summer, and now have our cool winter greens in the hoophouses. Walking tractor! Paul got the farm equipment of his dreams, a brand new BCS walking tractor. Don't ask me to elaborate - I'll get him to write something for you tractor nerds. 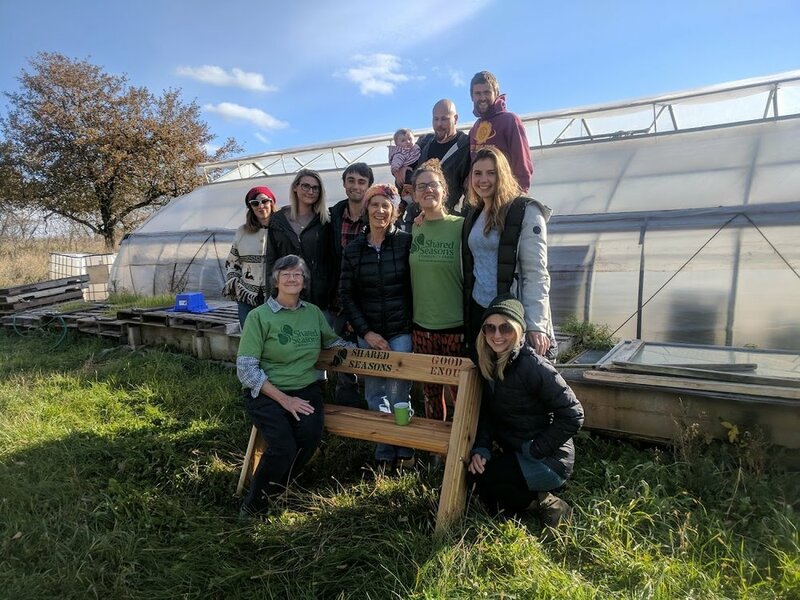 We're saying a sad goodbye to our CSA in Fond du Lac, but our friends at Good Earth Farm and Parkridge are picking up the slack and offering great and customizable CSA options in FdL. Bring back as many of those awesome folks from 2017 as possible! Give the chickens a new house! Details coming in another post, but yes, you should be excited too! More on farm fun! I know y'all love the farm fun, so let's get together out here! Event schedule & details to come! 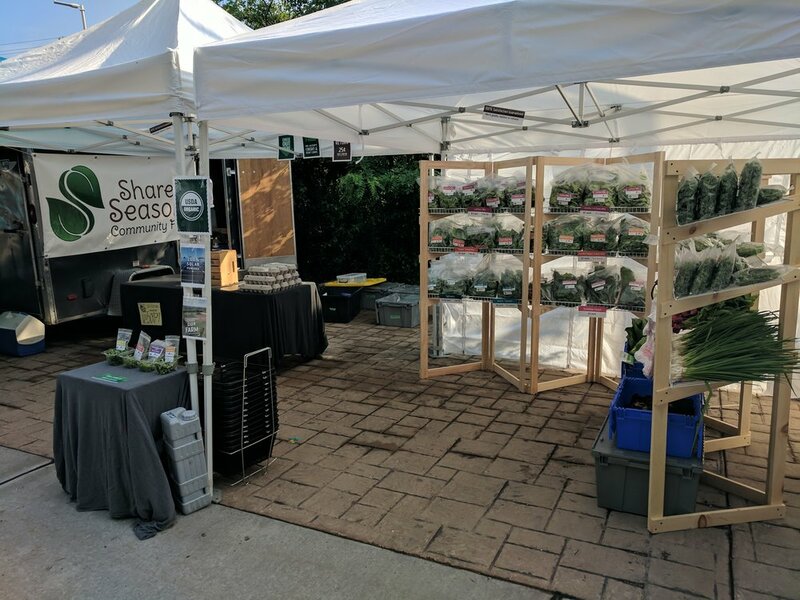 Keep bringing our best veggies to our great farmers markets in Brookfield, Tosa, and Fox Point! New animals?! Rabbits, on the way. A dog, I'm hoping. Kitten...possible. I've promised to make more funny videos, and I can't disappoint Jim Gage, so look out world! Use fewer exclamation marks in my writing. JK, LOL!!!!!!!! Like I said, sooooo looking forward to this new year. Like I said also, winter is sooooo too optimistic. Oh, well! Wish me luck. Thanksgiving is so close I can almost taste it! You will likely find it unsurprising that my favorite holiday is the foodiest one of the year. Since Paul and I started dating, the main event is held at his parents house. We, of course, are in charge of bringing the produce and the turkey. This year, I'm so excited to have a turkey from a neighbor farmer and friend, Vanessa at Victory Garden Farm. In addition to being our favorite, it's also the best organized. Paul's mom and I keep a binder of our recipes, timing, successes and failures to reflect on to improve each successive Thanksgiving. We've learning that soaking your turkey in brine is a huge help to keep it moist. The ginger squash is always a huge crowd favorite. And this year we need to half our stuffing recipe because last year people were too stuffed. This is the first time in my life that I've kept records year to year of a celebration like this, and I have to say, for me it really adds something to the fun of it to be able to have such a clear recollection of the years before. I totally recommend the Thanksgiving binder, especially if your mother-in-law will keep it at her house! We LOVE this time of year! It's our favorite foods, colorful trees, fuzzy slippers and warm woolen mittens. And, life starts to slow down and we can look around to reflect on the season that's passed. When I look around this year, I feel so incredibly proud of Paul. He's an amazingly dedicated farmer with a true passion for this work. He studies, researches, experiments, and fine-tunes our operation endlessly so that he can rest assured he's grown the best vegetables he possibly can. We hope you can taste the dedication! A Thanks for All The Help! Left: Micaela & Carolyn = CSA pick up day lifesavers and total rock stars! Right: Mel = newsletter recipe guru and S.S. test kitchen chef & Sara = person least likely to work on Thursday! This year, we have had the most amazing help! We owe a huge debt of gratitude to everyone who has supported, toiled, cooked, weeded, sold, planted, laughed, or guided us this year. I am always overwhelmed to think about the wonderful people in our lives who lend so many helping hands. So thank you first to our wonderful family - our parents and siblings are at the heart of everything we do, and of course we couldn't be doing anything without them. Thank you to our amazing workershares - who are now our family too because of the amazing years of sharing work and ourselves with each other. Thank you to our incredible employees - you have lightened our loads and our hearts with your indomitable spirits. Thank you to all our friends both in and outside of farming for teaching us and adding your own gifts to the farm. Finally, thank you to all our customers, members, farmers market shoppers, chefs - when you support us, you support the community and our environment, and you are part of creating the world we want to live in together. Enjoy your veggies and have a great week! 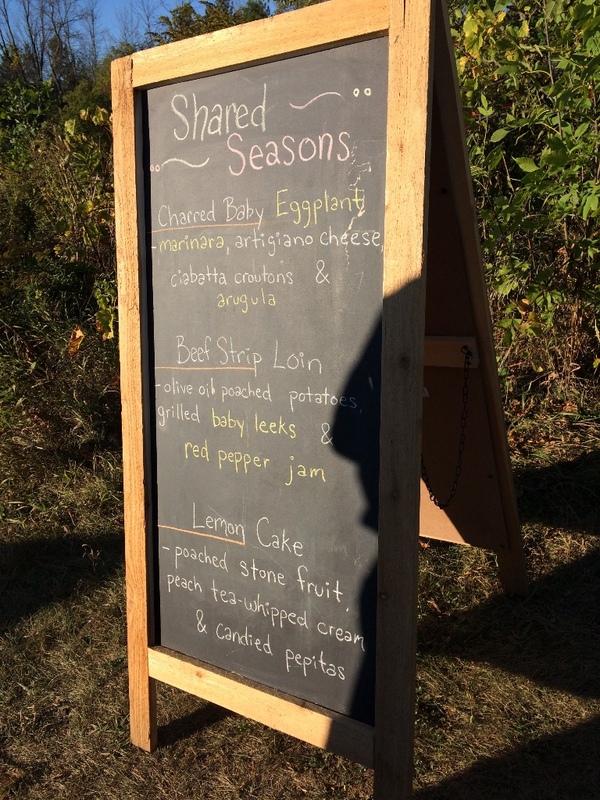 On Saturday, September 30, 39 delighted guests visited our farm for a tour of our fields and a delish dinner made from our veggies! 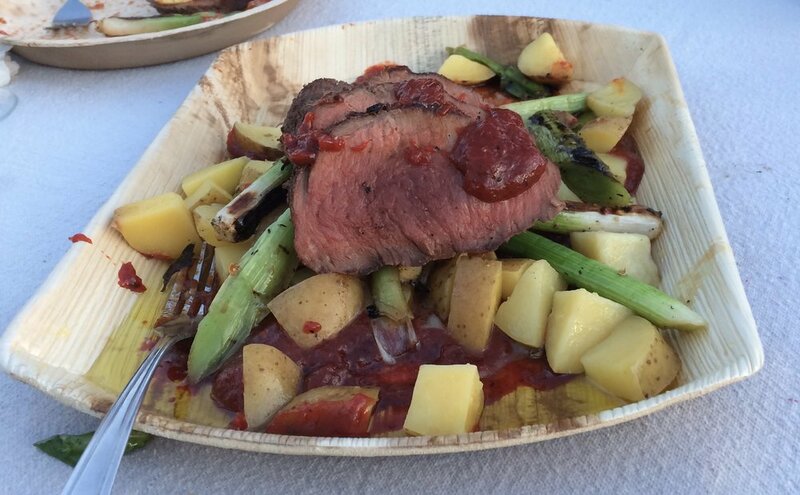 Many of you have heard of Braise, which is located in the Walkers Point neighborhood of Milwaukee - chef Dave Swanson was on hand to create an amazing 3-course meal! 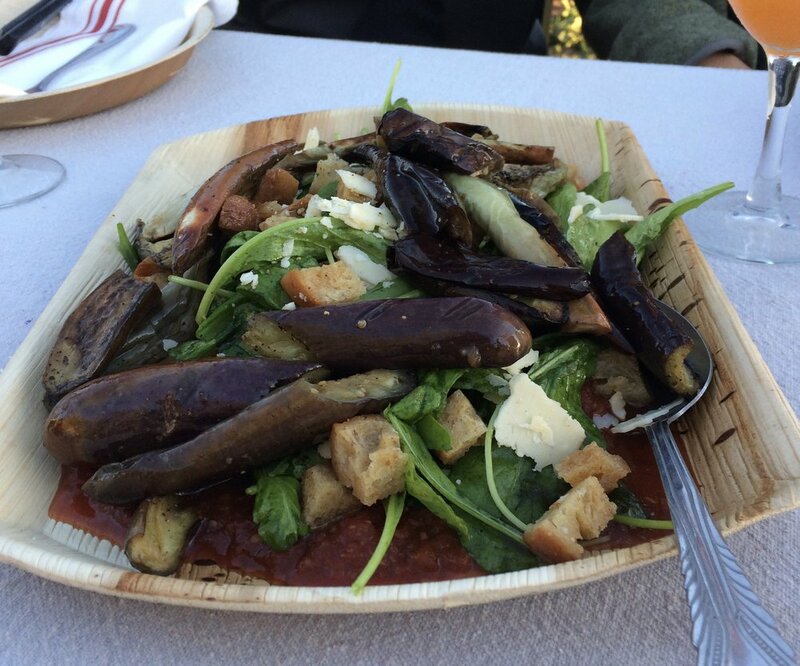 It was a gorgeous evening full of fabulous food, conviviality, and a sky full of stars and a waxing gibbous moon! It couldn't have been more lovely. Welcome to the Jungle! 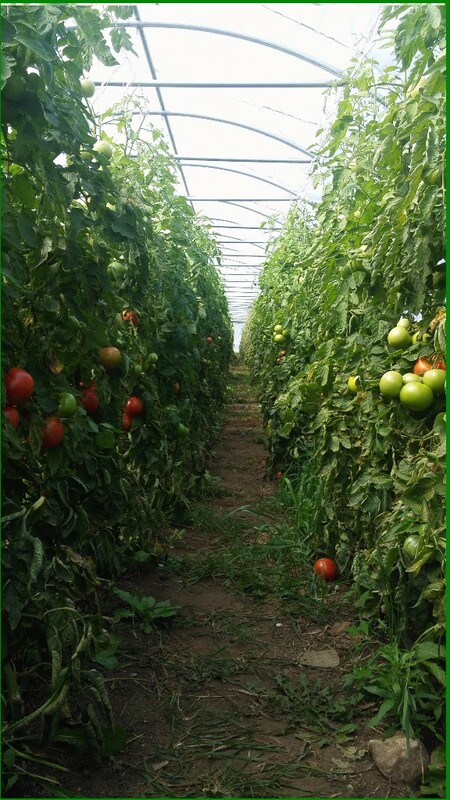 Our tomatoes have slowed their maturing, but the plants are still looking big, beautiful and bountiful! Wanted to share some silly pictures of the week, and a sweet story about Lola Rabbit. Your fabulous women at the Brookfield market provide our backyard wild bunnies with carrot tops weekly. They encouraged me to send you a picture of Lola enjoying the carrot top bounty. Thank you so much. Wanting to know more we asked the fabulous women who sell for us at Brookfield, and they explained that Lola comes all the way up to their porch to eat our greens straight from Terrie and Allen's hands! Wow! Now that's bunny love!! A really fun thing happened this week, and the story all starts with one of our favorite new farm tools, the Japanese Paper Pot Transplanter! Well, we buy our paper pots from a Wisconsin man, who imports them directly from Japan. Well, two of the managers of the paper pot company wanted to tour US farms using the product, and low and behold, they wound up at our farm this weekend! 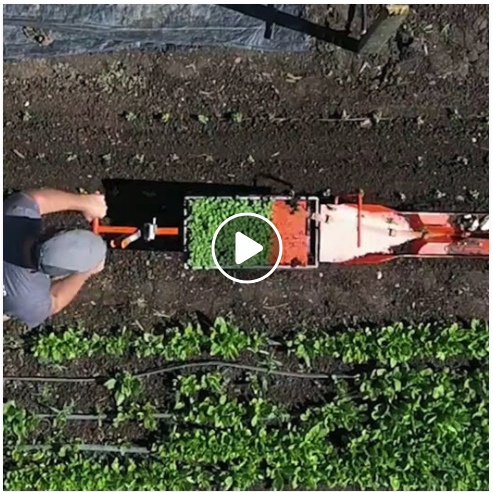 The same day, that a friend posted this video about the transplanter on my facebook page! (Twilight Zone Theme Music Plays). Last week was too exciting, so here are last week's chicken stories. 2) Possum Invasion! Last week Wednesday, long story short, a possum entered the chicken coop at dusk. Once I saw it, I started screaming my head off and expected the worst for my feather babies! But, thankfully, it didn't harm any of the girls, and *graphic details omitted* now the possum is no longer a threat. Do we wash the vegetables? An update! At many points, I've written about how much we wash the produce, mostly because that's one of my (Sara's) main duties at the farm, so I take the cleanliness of our produce seriously! (Or as seriously as I can take anything). 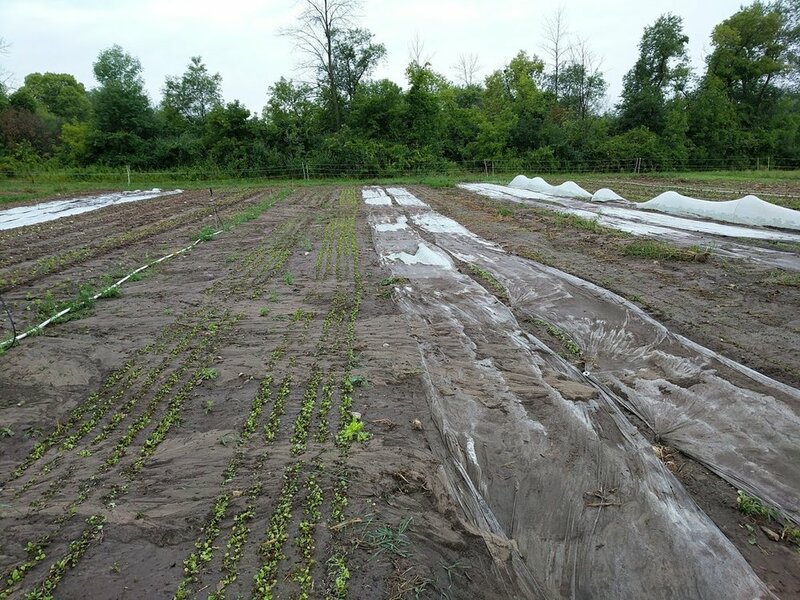 So, you may have noticed our peppers, eggplant, zucchini and cucumbers tend to be a bit sandy, and our basil is downright dirty! Why? We've started dialing down the washing on some vegetables in order to help their storage life for you. We've found that leaving the skin unwashed and dry is actually improving the vegetables quality when it comes time to eat it. And as for the basil, whoa, that stuff goes bad quickly enough as it is, but once it's washed, use it asap because it's going south! So, sorry there's a little extra washing to do at home now, but it will pay off in yumminess, I know! Also, while we do spend loving attention washing your produce, please wash and/or keep your eyes on what you're eating - it's all natural, so 100% of dirt, bugs, and grass are impossible to remove. Our pepper plants are going CRAZY! In a good way.